Westhill Central School District’s values shaped the conversations and goals for this Capital Project to enhance the delivery of education, how administrators and faculty members embraced the shifting educational model, and how robust guiding principles informed the creation of energized, student centered spaces. 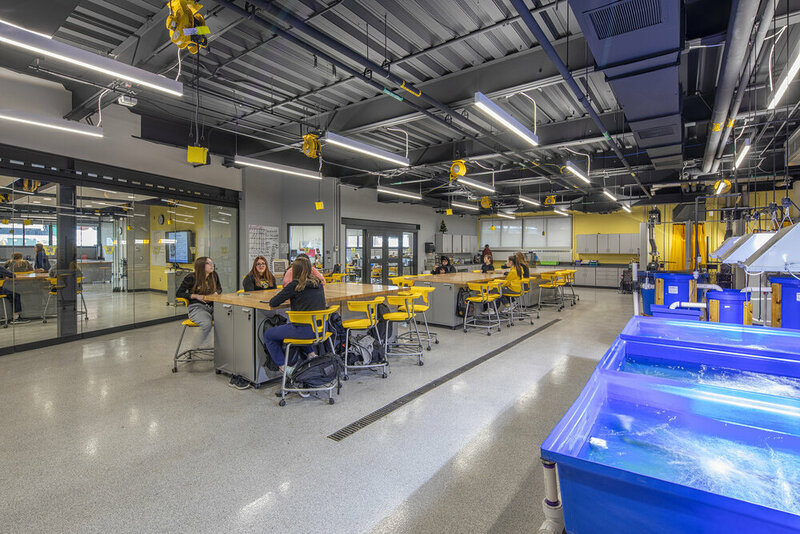 Extensive post occupancy research completed after the first phase of this two-phase renovation will be used to shape the pedagogy and space of the second phase currently under design (renovations to the first and second floors). The existing Westhill Academic Wing is a prominent feature of the Westhill High School. The existing building, which had not been renovated since the school was built in 1962, was designed with a precast cladding system with very little, non-continuous insulation. The academic wing is orientated with classroom windows on a double loaded corridor facing East/West orientation. 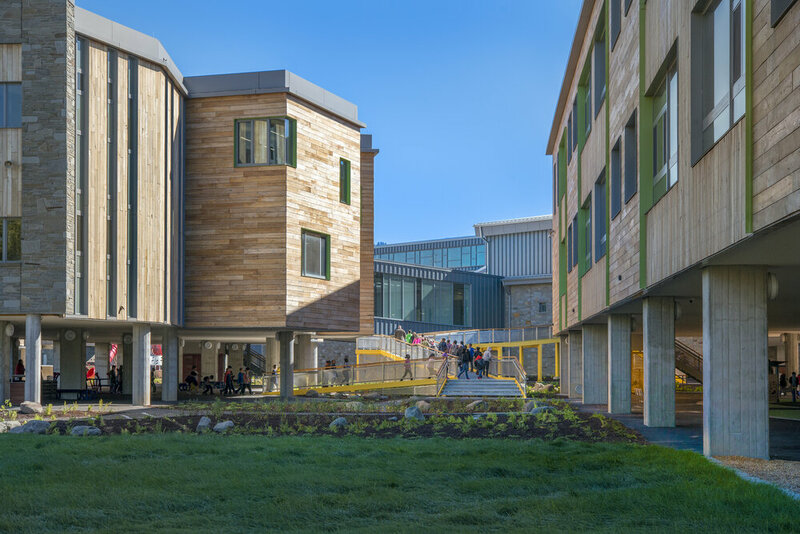 To improve these conditions the existing academic wing was modeled and analyzed using energy modeling software to find a baseline for energy efficiency and ways daylighting in the classrooms could be made less harsh due to the East/West orientation. 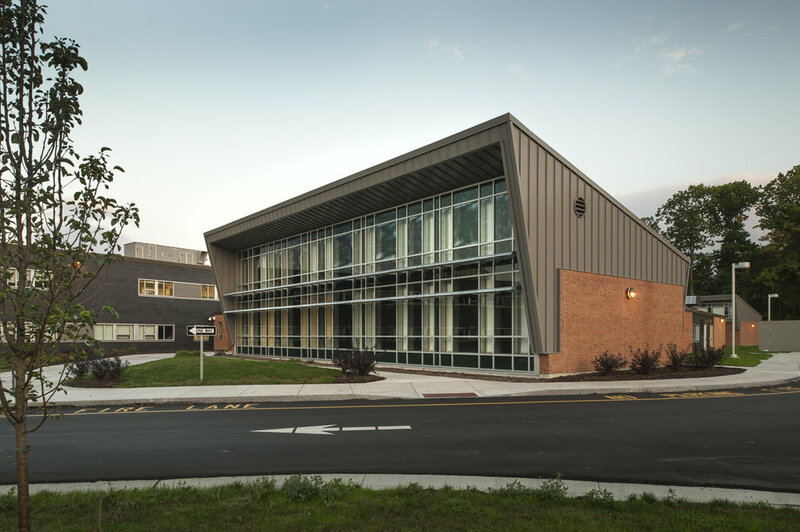 The design included replacing the exterior envelope with new windows, a terracotta rainscreen system with continuous insulation and replacing ventilation and heating/cooling distribution systems to create a high performance classroom wing. The East/West orientation of the windows in the classroom wing were causing glare during the morning and afternoon in these rooms. Vertical aluminum shading fins were applied to the East/ West facades to cut down on the glare in these rooms. The South façade was opened up with glazing at the entrance stairway to create a new dynamic image for the high school campus.